Since the greatest number of wildlife collisions occurs within the vicinity of the airport, and since the courts have determined that the airport operator is responsible for operating a safe, wildlife-free facility and has a duty to warn flight crews of wildlife activity, wildlife FOD management is of particular importance to airport operators. Wildlife management at airports is normally conducted on two fronts, passive and active. Most birds and mammals are attracted to the airport environment because it has something they want; generally food, water or shelter. It can be argued that the most cost effective way of managing wildlife on airports is to eliminate or modify the attractions to ensure that wildlife avoid the airport. Some wildlife control officers state that wildlife should be treated like unwanted relatives at your home — never let them get comfortable! Passive wildlife management is often referred to as habitat management. Unfortunately, it can never be completely successful because of the highly adaptive nature of most wildlife species. If an airport operator dedicates approximately 80% of wildlife control resources to developing strategies for effective passive management, then only 20% should have to be dedicated to active wildlife control tactics. Active wildlife control includes tactics to disperse wildlife that has ignored the habitat management barrier. Prior to developing and implementing a management plan for wildlife control at an airport, it is essential that a risk assessment be conducted. If a data collection system is not already in place, begin by surveying wildlife numbers, species, locations and the times when they are observed, in order to have baseline data for assessing the effectiveness of changes in the program. It is also important to continue collecting and analyzing wildlife strike data and to identify the species of wildlife struck by aircraft. All of this information is essential in order to make value-added changes to a program and to know when and where to dedicate resources. Commercial software is available that facilitates the documentation of wildlife control programs and provides the tools required to prepare risk assessments and management plans. The preparation of a risk assessment may sound like a daunting task, but it is nothing more than keeping track of and analyzing past and current circumstances at an airport with respect to aircraft operations, wildlife strike rates, and wildlife species and numbers. A large airport with a high volume of operations involving large turbine-powered passenger aircraft is immediately deserving of a formal wildlife control program. On the other hand, a small airport that deals mostly with light piston-powered fixed wing aircraft may manage with a communications and warning procedure to advise pilots of unusual wildlife activity. Airports considered to be at high risk with respect to wildlife are usually those that have traditionally experienced high numbers of wildlife strike incidents; especially if those incidents have caused damage to aircraft. Also in the high risk category are airports that have incompatible facilities such as landfills situated nearby or are located near migrating waterfowl staging areas or other features that attract large flocking birds. These airports must implement aggressive wildlife control programs. To be used for the various wildlife species that must be controlled. 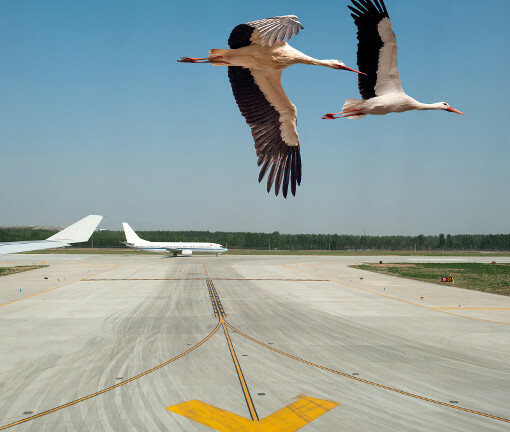 For example, many airports have serious wildlife problems at night, making it necessary to schedule wildlife control activities around the clock, or in some cases, migrating waterfowl create extreme demands on resources during the spring and fall. It is essential that adequate control resources be dedicated to those wildlife species posing the greatest risk to aircraft. The risk assessment should provide this information, and a priority list enables the wildlife control team to focus their attention on species such as Canada Geese rather than on smaller birds that may not pose a significant threat. It is important to record all wildlife sightings and all actions taken to disperse wildlife in order to gauge the success of products or techniques. For example, it is important that wildlife control officers have established procedures with ATS providers in case a flight operation has to be held back due to unusual wildlife activity. Wildlife control officers must know who to report problems to. It is also essential that a committee is in place to provide a forum for wildlife control staff to address issues that require decision making by the airport management team. Wildlife control officers must be aware and respectful of protected species legislation to avoid conflict with local enforcement agencies and animal welfare groups. Every airport must have appropriate permits for killing and hazing wildlife. Valid permits for the use and storage of all firearms are mandatory, and wildlife control staff must be trained in the safe use of firearms. An airport wildlife management plan should document the actions required to minimize the wildlife attractions at the airport. The airport wildlife management plans should include information and guidance about the products that will be used in hazing initiatives, the suppliers of products, human health and safety implications and an inventory process to prevent depletion of stock. Although not all encompassing, the preceding bullets summarize issues that must be addressed in an airport wildlife management plan. The effectiveness and efficiency of an airport wildlife control program is very much dependent on a science-based formal risk assessment and management planning process, and the cost associated with developing the risk assessment and management plan will be recovered as efficiency gains are realized. Perhaps even more important is the value provided by a formal, documented plan should legal action be taken by an air carrier following a damaging wildlife strike incident. It is also useful and cost effective to include in the planning process a professional biologist who has experience in wildlife hazard management. Issues associated with natural science applications can be much more complex than first assumed, and current knowledge of effective wildlife management strategies and tactics is crucial to a successful plan. Finally, an airport wildlife management plan must be signed-off by the management team, demonstrating support and commitment for the program. Now that we have discussed some of the issues that provide a framework for the implementation of actions to manage wildlife hazards at an airport, we can conclude with a short discussion on passive and active management programs. Passive management, as previously described, refers to the habitat management initiatives that an airport operator can take to reduce the attractiveness and accessibility of the airport to wildlife. The primary goal is to eliminate or modify food, water and shelter resources. It is important that all food sources such as human food waste, fruit producing vegetation, seed crops, agricultural activities, prey species and certain vegetation types be eliminated, modified or otherwise managed to minimize their availability to wildlife. All open and running water must be managed to either make it unavailable or unattractive to wildlife. Finally, shelter habitat such as old hangars and forested areas on the airfield should be modified or removed in order to deny use by wildlife as a place to roost, rest, or hide. Signs, airport lighting fixtures and buildings should all be designed or modified to prevent birds from using them as perching or nesting habitat. A well-maintained, properly designed fencing system will prevent deer from accessing aircraft movement areas. Active wildlife control usually refers to the dispersal or hazing initiatives undertaken by wildlife control teams. There are many products advertised for dispersing wildlife, but it is important that airport operators carefully study a product before investing large sums of money, and obtain advice of recognized experts in the wildlife management profession. Many products are designed for the agricultural industry where their effectiveness is only required for a relatively short period of time as crops ripen. However, in an airport environment, products and techniques must be effective for a much longer period of time. Also, the efficacy of many products has never been tested in a rigorous, independent environment and is only supported by advertising claims and anecdotal evidence. Wildlife eventually adjusts to almost any tactic used to disperse it. If a technique or product does not cause physical harm, wildlife will eventually begin to ignore the threat. Despite considerable advances in the science of wildlife management, the time-proven technique of hazing with noise producing pyrotechnic products is still considered by many wildlife control experts to be the most effective way to disperse wildlife. Pyrotechnic programs must be properly conducted to remain effective over the long term, but skillful application of pyrotechnics is likely the most effective means of dispersing wildlife. Devices that may pose a fire threat must be handled only by properly trained personnel, and may be prohibited in some areas or during times of fire danger. High-risk areas should consider other tactics except under ideal fire-safe conditions. Falconry can be an elegant way to disperse birds, and it has the added advantage of being acceptable to most animal welfare groups. At the end of the day, falconry is expensive, very dependent on motivated and experienced handlers, and only useful during periods of good weather. However, it does provide a public relations benefit to a large airport operation that can be of priceless value. If a falconry team uses other techniques in order to address the limitations inherent in the practice, a falconry program can make it much easier for an airport management team to deal with the negative publicity sometimes associated with wildlife control programs. This list of actions that can be taken by an airport operator to minimize the exposure and probability of wildlife collisions with aircraft is in no way complete. There are many excellent publications that provide more detailed information on wildlife management strategies and tactics. Probably the most important point that we can make is that an informal, ad hoc wildlife program may be doomed to failure. Successful wildlife management requires formal, science-based underpinnings and long-term success depends on flexibility, motivation and persistence. A truly successful wildlife control team will always have the support and commitment of the airport management team, and will continuously search for new and innovative ways to counter the threat that wildlife poses to safe airport and aircraft operations. This entry was posted in Aviation, Operations, Training. Bookmark the permalink.